I have two easy sugar cookie recipes should have been posted here long ago. The first is an instant gratification, no-chill sugar cookie version. The other is a chilled dough that also makes perfect cut cookies, AND at room temperature is the perfect consistency to use in a cookie press. This time of year, I like to pre-mix and chill dough, so I can bake them on another day, and break the kitchen tasks down into smaller time chunks. But if you catch a late night craving for the perfect sugar cookie, then the un-chilled dough is the right choice for you. Both are delicious, and wonderful to work with. 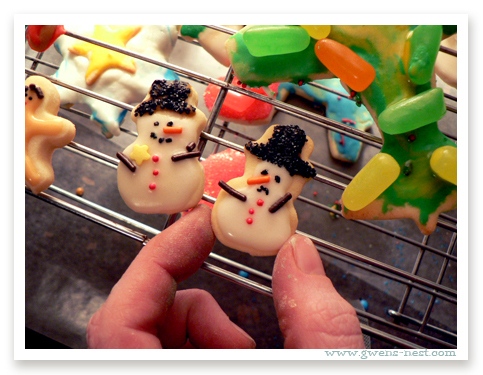 Pretty much sums up everything I love about these easy sugar cookie dough recipes too! First, I’ll walk you through the basic steps, and then I’ll give you printable recipes for both the no-chill sugar cookie recipe, and my classic Christmas sugar cookie recipe. 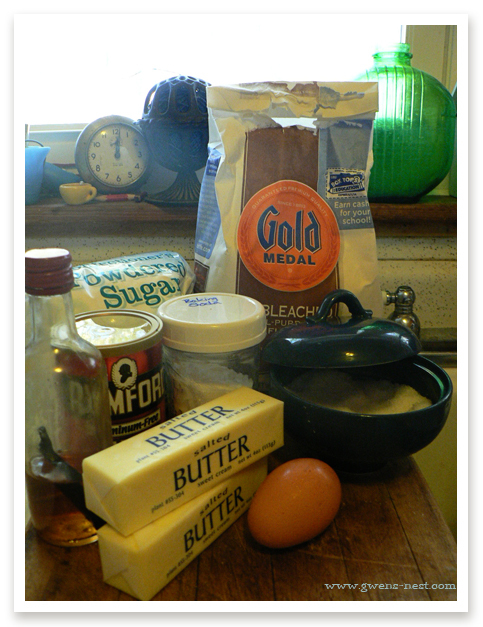 You’ll need butter, eggs, salt, baking powder/soda, flour, regular sugar, powdered sugar, and vanilla extract. And I like to add a touch of lemon oil or lemon extract to the mix too. And then add the egg(s) and flavorings, and just mix to blend those in a bit. I usually divide the dough into 4 parts on squares of wax paper (you can reuse the one from the flour). I plop a blob of dough onto the center of the wax paper, and then fold both sides in over it, and smash it into a disk to chill. 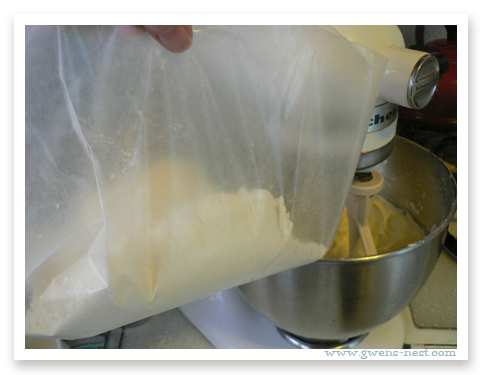 I slip all the wax-paper covered dough disks into a gallon zippie bag, and I’m done for the day with the chilled dough. Dust down a large surface area with powdered sugar. Which is like flour, only it’s yummy. 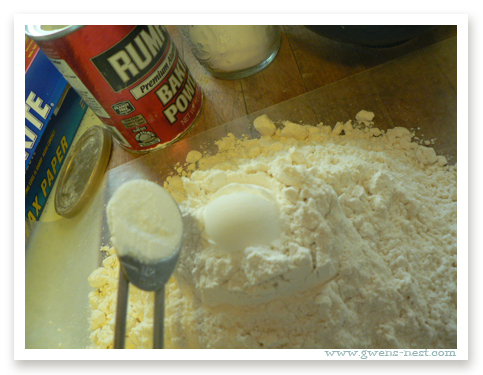 Plop dough onto your powdered surface, and rub down rolling pin with more powdered sugar. I like to keep a flat dish of powdered sugar handy, because I will keep dusting the dough down with it, and even dip the cookie cutters in it too. 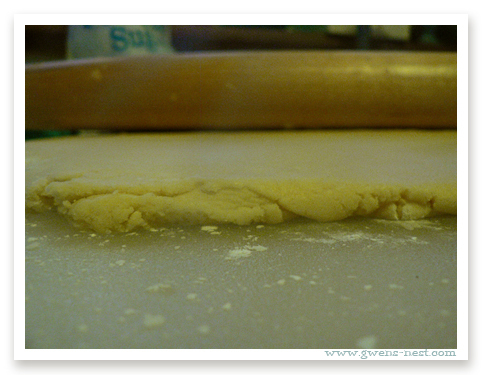 Roll the dough to the thickness you like. 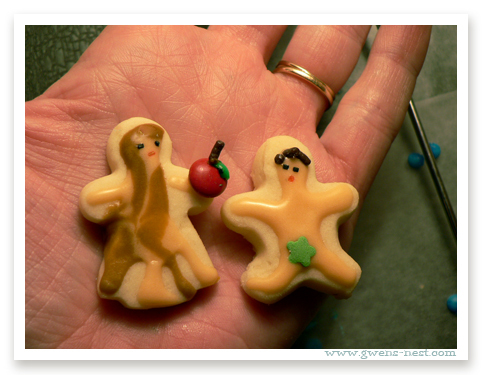 I prefer 3/8ths of an inch, which is just a wee bit more than 1/4 inch, and makes much sturdier cookies. Dip your cutters in powdered sugar, and start cutting your cookies at the edge, keeping them as close together as possible. 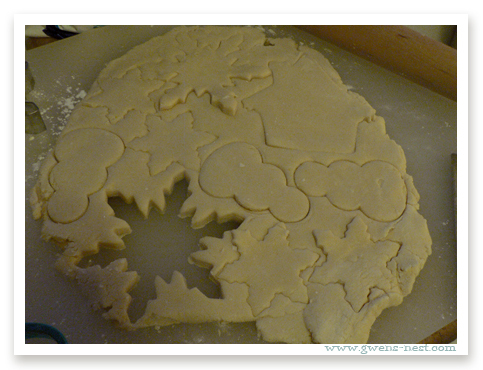 With my littler kids, I just let them leave the cutter on the dough, which makes it easier for them to place the next one without removing limbs and star points. We’ve noticed that the cutters with narrower parts like to lift the dough…so we just roll with that and take it right over to the parchment paper lined pan. where we gently tap/nudge it out of the cutter. Tip! I love parchment paper for baking cookies. I can line all 3 of my pans with one sheet, and bake pan after pan of cookies without ever having to change out the sheets. It stays nice and clean, and the cookies slide off like magic. Foil mangles my cookies, and gets messy too quickly. 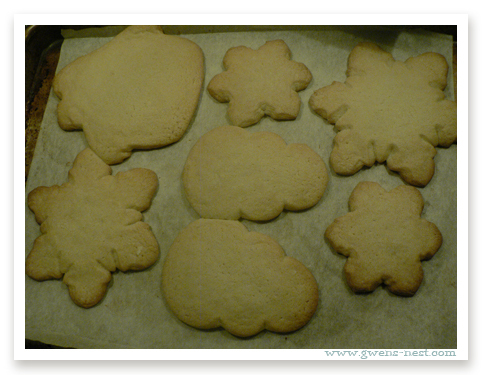 I like using a dough scraper or flipper to move the rest of the sugar cookies over to the pan. Save those between cookie scraps, and re-roll with the next batch of dough. Here we area, all loaded onto the pan! Leave a little room for spreading. In my opinion, these are overbaked. My friend Donnah-the-amazing-cookie-baker-and-engineer, who gave me the no-chill recipe, would be ashamed of me. Her cookies are perfectly-perfect. Mine are for the kids to decorate. These are not anywhere near burnt, but they’re definitely browner than I usually like for them to be. But nobody really cares when they’re slathered up with frosting and candy, right? Tip! If you want really lovely, sharp and shaped edges, Donnah tells me that you can grab your cutters while the cookies are fresh from the oven, and re-cut those puffy edges off! This will get rid of that bit of extra brown, and give you nice clean edges that don’t look chubby. Now, decorate to your heart’s content! You can go simple or fancy. We go sort of gypsy-crazy. It’s what we do here. This has been a family tradition for us since our first little one came to our home. 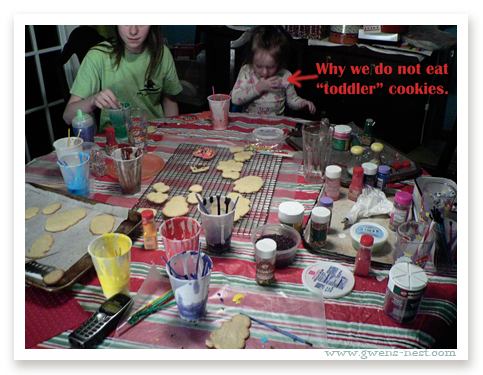 We do it every year, and the youngest ones usually are in their high chair, and are allowed to completely destroy one cookie with frosting and sprinkles, and eat as much as they can stand before being tucked in bed. Visions of sugarplums and all that. This is our usual setup, but I’ve upgraded to vinyl tablecloth since this photo was taken. Believe it or not, all of this comes together in one evening. I work on cutting /baking with one kid at a time “helping” to cut out, and the rest are on frosting-color-mixing duty. 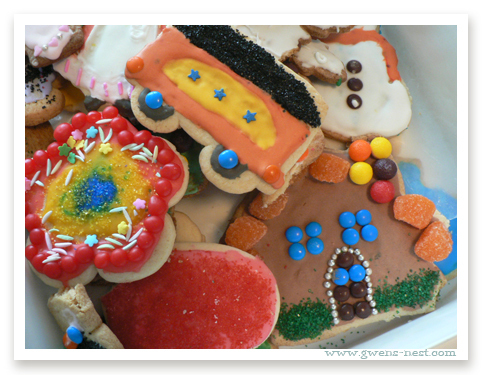 The Sugar Cookie Icing recipe makes gorgeous, professional looking cookies. It’s pure white, and dries to a lovely crispy and durable finish. 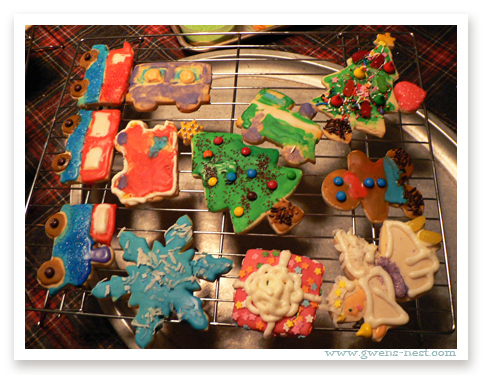 This is Donnah’s recipe as well, and you can see all the lovely cookies we made together here. 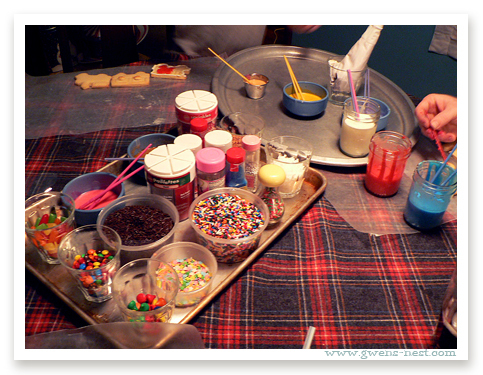 The photos of our family decorating party use a simple buttercream style Sugar Cookie Frosting. I’ve used this recipe for years. It’s fun and easy to paint, pipe, smear, and fingerpaint with…and it always tastes great! What I’ve found works best is to make a wax paper “placemat” for each decorator. We set out trays full of colored paint-on frosting and loads of little candies and sprinkles (most of which I collect at season-end-clearances prices). I bought a big cup of little cheapie art brushes at Hobby Lobby, and we put 2 in each color of frosting, and run those suckers through the dishwasher each year. Mixing frosting color brushes, and licking fingers is against the law. I also have moved to plastic cups or bowls for frosting. I make one piping bag of white, and add cocoa powder to the black or brown frosting so it’s yummy! I set up a wax-paper area on the sideboard, and we start filling up the stacking cooling racks as we go. A “temptation” theme is appropriate for cookie season, no? This no chill sugar cookie recipe came to me from my friend, Donnah, who makes *amazing* sugar cookies. It’s thoroughly tested, and gets high ratings from my crew. Perfect for last minute cookie cravings, this makes about 3 dozen cut out cookies that are ready to roll and bake as soon as you mix them! 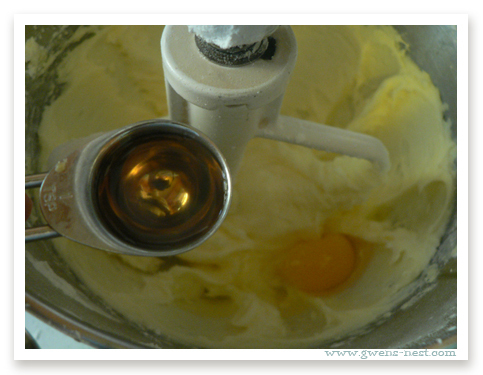 In mixing bowl, cream butter with sugar until light and fluffy. Beat in egg and extracts until just blended. 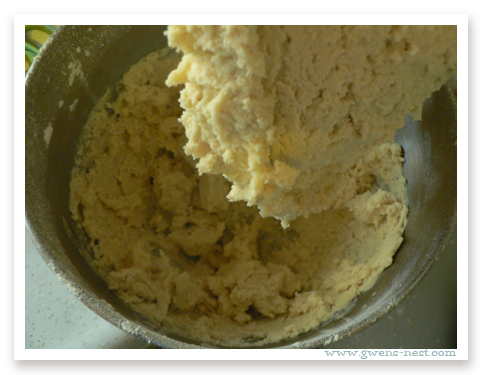 Mix flour, baking powder and salt, and add to butter mixture 1 cup at a time, mixing after each addition. On a surface dusted with powdered sugar, roll each ball into a circle approximately 12 in. wide and a wee bit thicker than ¼ in. thick. Dip cookie cutter in powdered sugar before each use. 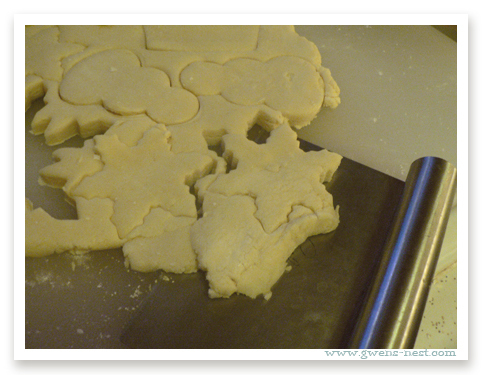 Place cookies on parchment paper on an ungreased cookie sheet. Bake for 5-6 minutes or until cookies are just barely lightly browned at the bottom edge. Frost with buttercream or royal icing when fully cooled. 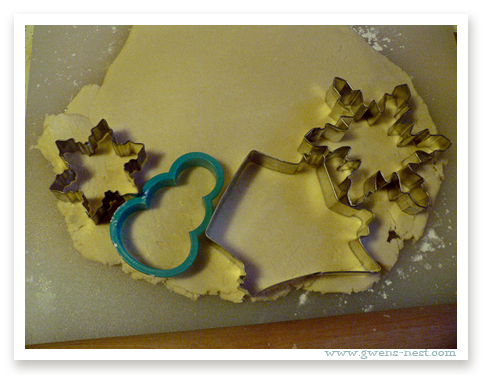 If the edges of the cookies spread, and look "chubby", you can grab the cookie cutters, and re-cut them as soon as you remove them from the oven. 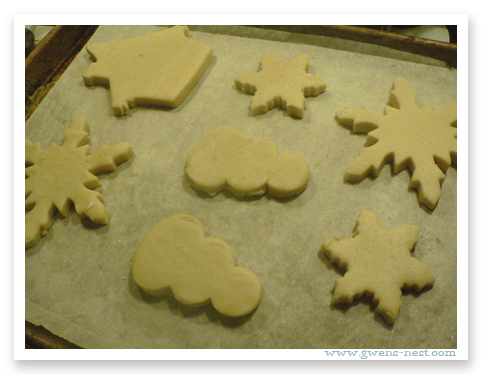 And this is the easy sugar cookie dough recipe I use every year for our family Christmas decorating night. I also make candy cane cookies out of the same dough. It enables me to mix the dough all at once, and just flavor each batch differently, so it’s a big time-saver for me. This is my dream sugar cookie recipe...it's my adaption of a recipe by Jill Saunders called "The Best Rolled Sugar Cookies". They really are the perfect dough to work with, and make delicious, sugar cookies that are flavorful, soft, and yet solid enough to hold up under copious amounts of frosting and candy topping. Hope you enjoy them as much as we do! In a large bowl or stand mixer, cream butter and sugars until light and fluffy. Add eggs and flavorings, and mix to blend. 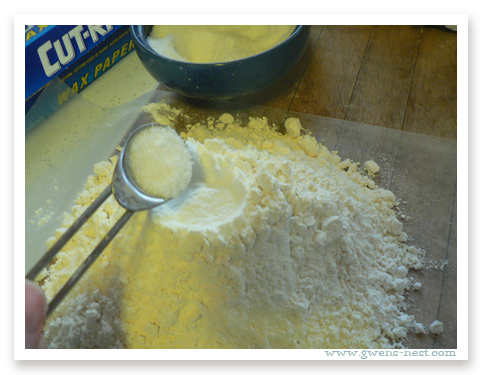 Measure the flour onto a sheet of wax paper, and mix in baking powder, baking soda, and salt. Stop mixer, and add about ¼-1/3 of the flour mix, and then blend in. Repeat until all of the dry ingredients are mixed in. 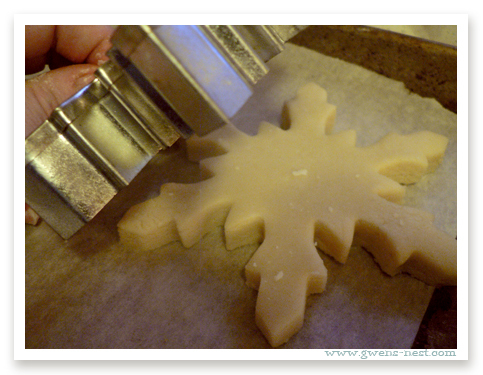 Cover and chill dough for at least one hour or overnight for rolled and cut cookies. 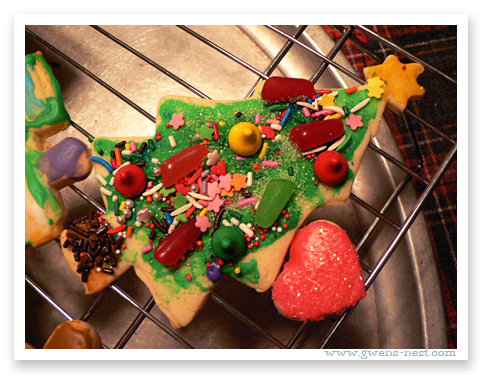 Or use immediately for spritz cookies in a cookie press. 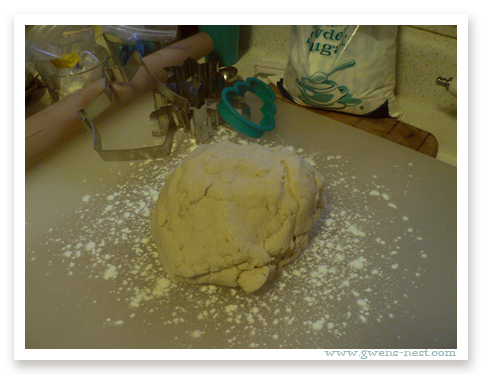 Roll dough on powdered sugar dusted surface to slightly thicker than ¼" (3/8" is what I shoot for). Dip cookie cutters into powdered sugar between each cut. Place cookies ¾ inch apart on baking sheets, and bake for 6-8 minutes, until the cookies are just barely brown on the very bottom edge. Let cool completely before decorating with royal icing or buttercream. Have fun, and I want to see photos of your crazy creations! 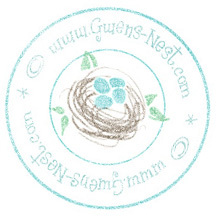 Post links in the comments, or post them on my facebook wall at my Gwen’s Nest page.